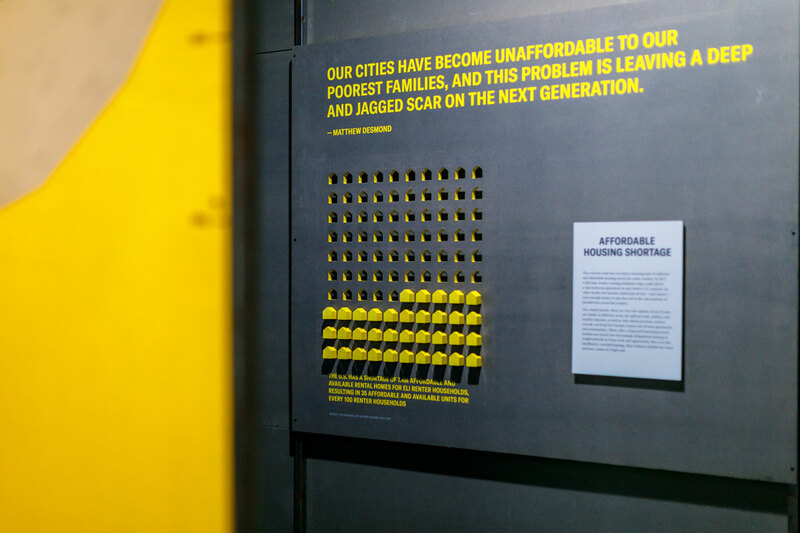 The Evicted exhibition is designed to introduce our visitors to an important and underreported topic: low-income renter eviction. We worked with sociologist Matthew Desmond, an architecture firm, Matter Architecture Practice, a radio producer, Unfurl, and a graphic design firm, mgmt., to present a unique museum experience: an exhibition that situates visitors in a bleak scenario experienced by millions of Americans. SOCIETY IS POSSIBLE, AND POWERFUL SOLUTIONS ARE WITHIN OUR COLLECTIVE REACH. 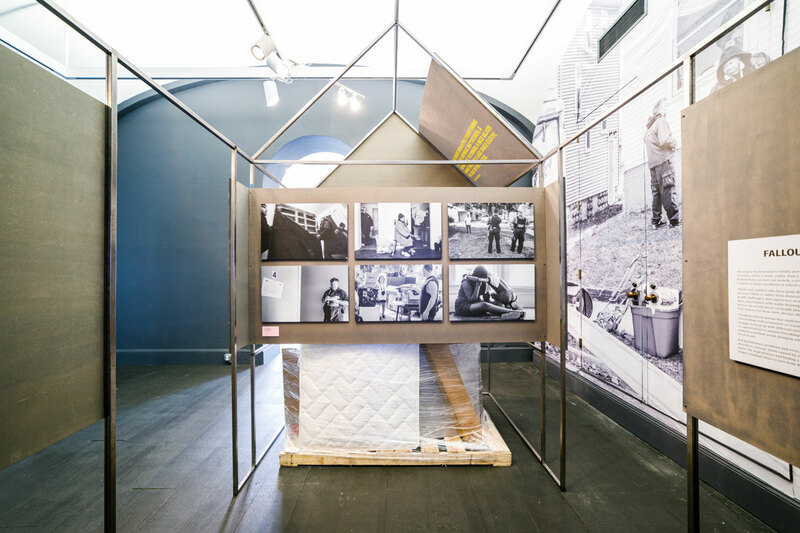 The exhibition uses four structural “houses” to establish the fundamental idea—home should represent safety, and the eviction crisis has put the relationship many people have with shelter in danger. The houses in the exhibition, though, are not quite right; they’re not doing the job of providing shelter and safety as a home should. The wallpaper is on the outside, the outlets are on the outside, and one of them is missing most of the roof and walls. These structures are showing us what happens when home is threatened: everything goes wrong. Using common house keys as visual tools in a graph showcasing an ugly statistic, as we do in the beginning of the exhibition, is a way to twist our understanding of home, demonstrating what happens when home is ripped away and your key no longer works. The house key is a simple, profound, and poignant symbol of home. It conveys all the security that should accompany the place we live—a key is what separates home from the outside world and only allows in trusted friends and family. Eviction rips apart that connection. Featured in the exhibition is a shrink-wrapped pallet of household belongings, demonstrating visually that violent moment in an eviction when a family’s belongings are no longer their own—they are left for scavenging by the neighbors, or they are stored, unreachable, indefinitely. These particular items will be returned to a local non-profit, A Wider Circle, after the exhibition closes, and will be distributed to those in need in our own Washington, D.C., area community, helping a new family start over at home. In this exhibition, we have the opportunity to hear from people who have experienced eviction in their own lives. Our audio production team from Unfurl Productions spent some time in Landlord-Tenant court in Camden, New Jersey, and found several people interested in telling their stories to a wide audience. I believe being able to hear from people about their own experiences is always a powerful way to build connections in an exhibition. We used a map of the United States at both the beginning and end of the exhibition. Though eviction is a crisis nationwide, and we see that from the start, our country has the capability to change this narrative. The ending map shows examples of folks all over the country from throughout the last century who have advocated for change and helped people facing housing insecurity. Read more about Evicted, or download a printer-friendly version of this guide.